We've brought you renditions of Hava Nagila in more countries and provinces than we can name, but until now we haven't found one from British Columbia. This Canadian province, north of Seattle, Washington, is home to two musical genres that we wouldn't have put together, but they seem to have found each other. 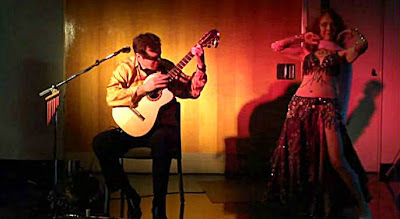 The first is guitar, as exemplified by Colin Godbout, the Global Guitarist of Vancouver, and the second is the art of belly dancing, as performed by Asmira, who has been running a school of oriental bellydance for the past 24 years in Victoria, also in British Columbia. Last month, Godbout joined Asmira in Victoria for a concert of music from countries along the route of the Orient Express, which ran between Paris and Istanbul. At the end of this performance, they joined in an encore of Hava Nagila, ending with a flourish of Miserlou, a popular Greek song about an Egyptian girl, usually played as a dance at Jewish weddings. Go figure, and enjoy! Belly dancing helps keep fitness and it's also good for our health.When women are dancing,they look comfortable and with great confidence.I intend to have a belly dancing class and learn it.Wonderful!